I have one of those jumbo d20s that flash and light up when you roll a 20. That’s basically what’s happening in my brain right now. Great episode! Good job, guys. The Dark Master thing is my fault. Back when we were first starting to heavily promote the game on Facebook, we had this little promotion to encourage more people to like the page. I whipped up this little graphic at the end…the Dark Master wasn’t meant to be Joseph, just some random fictional entity, but people interpreted it that way and started referring to him as the Dark Master. Joseph Goodman is the man. The fanbase of this game is so enthusiastic and positive because the people behind it, Joseph in particular, lead by example. Fascinating unpeeling of the heritage; that DCC is very much a culmination makes it special and credit to Joseph for bringing all those themes (and people) together. One thing I worry about with Goodman Games: with all the various games (and now modules for D&D5) Joseph’s putting out, I fear DCC might fall by the wayside. Here in the UK, I’m still eagerly anticipating the Chained Coffin and Purple Planet. Look forward to enjoying the next pod you Judges cast! I wouldn’t worry too much, Dylan. Goodman Games has a long history of releasing and supporting a diverse array of games. 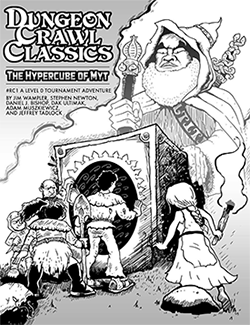 Although DCC (as both supplemental adventures for 3.5 and 4th edition and as its own ruleset) has long been GG’s main product line, a glimpse back over its history shows a bunch of other lines that have been released and supported. Rest assured DCC RPG remains important to everyone at Goodman Games and there’s more in store for the year ahead. The Dark Master is going to be a tough episode to beat, Judge J’s. This episode needed to be longer!